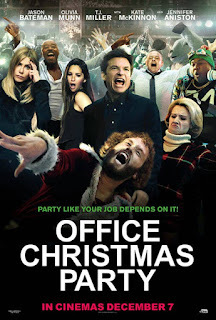 Office Christmas Party was an R-rated holiday farce, which at this point is really a sub-genre in itself. Blame the success of Bad Santa if you like - I'm pretty sure at least one of these has been made every year for the last decade or so. This one falls somewhere near the middle of the pack. If you can make it through the first two acts, the film's climax is actually quite a bit of fun, but getting there is a commitment. Nothing in here is awful, but until the plot fully spirals out of control, it's fairly tedious. I feel like I've written this before. I mean, this is basically what I said about A Very Harold and Kumar 3D Christmas: the set-up was boring; the payoff was solid. Same with The Night Before (though that didn't take quite as long to pick up). I guess it's a common issue with these movies. He's actually kind of good in this movie. I'm not generally a fan, but he's well cast as the son of the company's founder. Despite being born to a life of wealth and privilege (which the movie does address), he's been a failure all his life. He tries to live up to his legacy, but falls short. His more successful sister, Carol, played by Jennifer Aniston, is positioned as the film's antagonist. Despite being smarter and more driven, she was never the favorite. But now that their father's passed, she's climbed the ladder to CEO. And, given the moderate success of her brother's branch, she's demanding layoffs. Hence the party to convince a potential client fixated on office culture to sign on. If they can get the contract, everyone keeps their job. And all of this would make a lot more sense if anyone I mentioned above was the main character. Let me tell you instead about Tracey, played by Olivia Munn. Tracey is the company's brilliant but eccentric head of R&D, and - despite being undervalued - has spent years working on something which, if successful, could revolutionize the world, save the branch, and... hell - skipping ahead to the end - save Christmas. Astonishingly, she's still not the main character. The main character is Josh, who sort of keeps the branch afloat. Josh is played by Jason Bateman, who's basically playing the same character he portrayed in... literally everything I've ever seen him in. He is the least interesting character in this movie, and he has little to no involvement in the plot. His major arc sees him evolving from a guy unable to go through life without a safety net to a guy who's willing to take some risks. But the actual story is really driven by the other three characters I mentioned. Arguably, it's driven by Tracey and Carol, though they get less screen time. Clay makes decisions, but he feels less like a driving force than an element being pushed by the current. Which is technically bad writing, but... huh. It makes for an interesting twist. While they're not the POV characters, the women are more interesting, funnier, and the ones with agency. The actual plot of this movie is best described as a proxy battle between Munn's Tracey and Aniston's Carol over the future of the branch. In fact, the resolution is triggered by an argument they have where Carol's worldview teaches Tracey a lesson, giving her the last component she needs to finish her invention. The story is about their relationship. Only, aside from a bit of unexplained animosity, the characters have nothing to do with each other. Tracey has a generic love story with Josh, while Carol's main arc is concerned with repairing her sibling relationship with Clay. I'm just going to throw this out there: if Tracey had wound up with Carol, this review would be far more positive. I should probably mention that I'm skipping over at least a half-dozen subplots and twice as many minor characters. Hell, this is a movie co-starring Kate McKinnon, and this is the first time I've typed her name. But while McKinnon gets a few fun moments, she's grossly underutilized, as are Rob Corddry and Vanessa Bayer. This movie has a surprising number of great comedic actors wedged in dull parts. That said, Jillian Bell gets one of the movie's more memorable roles as a pimp, who... it would take way too long to explain. She only gets a few scenes, but she's hilarious. Also, her character is way more important to the plot than Bateman's. Seriously. They could (and with all due respect to Jason Bateman, absolutely should) have cut him entirely from the script. As a reminder, he was the main character. As is probably obvious, this is a tough movie to summarize or rate. There were serious structural issues that made the first half feel like a sitcom (not an awful sitcom, but nothing exceptional), and if you spend any time thinking about the movie, you realize there was no real point to this thing. But that last act was a hell of a lot of fun, and the characters who made it fun were the ones who are almost always sold short in these movies, namely the women. Aniston clearly enjoyed playing a ruthless capitalist. She's cruel, driven, and merciless, and you still sympathize with her, because the other side (exempting Munn's Tracey) are incompetent man-children. Then, astonishingly, the movie doesn't punish her. Structurally, she motivates the leads as a villain, but everyone winds up on the same side in the end. She doesn't even get there through some sort of forced rehabilitation arc. She just sort of weighs her options and makes a choice. It's as though the movie decided it would be more fun to side with her than punish her. And it's 100% right. Because otherwise, we wouldn't have gotten the scene where she and Munn beat up some mobsters, and I really liked that scene. What's left? Oh yeah, Christmas. And Christmas parties. The whole... premise. The movie's approach to this was pretty obvious from the name and rating. The party would start mild, build in intensity, then eventually grow into something impossibly massive and destructive. To the movie's credit, it managed to sell the absurdity. The shots of the Christmas party in its later incarnations, as well as the aftermath, were sufficiently over-the-top. Realism wouldn't have worked, and they wisely went in another direction. There was a brief montage during the party's craziest moments where - and I don't think I'm reading too much into this - they seemed to be purposefully devolving the holiday to its pagan roots. I almost don't want to spoil the iconography of this sequence. You'll know it when you see it - it's the scene with Ronnie James Dio's fantastic metal version of God Rest Ye Merry Gentleman playing in the background (my all-time second favorite metal version of that song). All in all, this is a decent Christmas comedy. It's nowhere near as good as Bad Santa, and it has a lot of problems. But the ending is good enough to overlook a lot of issues. I don't think I'd recommend this to anyone who isn't a fan of these kinds of comedies, but - for those of you who are - it's definitely better than I expected it to be.